Aroma: Very light, nothing pungent. Medicinal (stirring memories of Robitussin from childhood). Appearance: Pours like a flat cola. Very few bubbles. Light, caramel color. Mouthfeel: Akin to the appearance, a lot like a flat cola. Doesn’t really commit to one kind of feeling. Slightly like a mouthwash. Pumpkin: None of the usual sweetness. Spicy and bitter. Ingredients: A little bit of ginger as well, black pepper, honey, cardamom, slightly plumy. Full disclosure, I am not one drawn to pumpkin beer in general. I appreciate that this beer is not sweet, but it does not turn me into a believer, either. Vanilla, caramel aroma that is sweeter than its taste. Reddish-brown hue. Mostly well-balanced flavor. Not a sugar bomb. Not a spice overload. Not watery in taste, but slightly so in texture. Mouthfeel lacks desired richness. Limited real pumpkin flavor. Fall spices of cinnamon and cloves come to the fore. Medium length finish of the same fall spices. When you’re known for show-stopping IPAs, what’s the next world to conquer? The murky, no-brewer’s land of pumpkin beer, where some fear to tred and others just plain give zero effs and don’t bother to think twice about not going to. 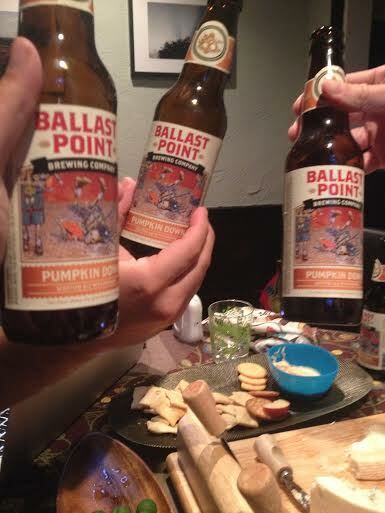 Ballast Point, with no need to prove their quality, take a winning approach of using a tried and true recipe for Piper Down, a caramel and toffee based Scottish Ale, and add brazen roasted pumpkin to it creating a nuanced new addition to the pumpkin ale line-up. Pouring a subtle cognac hue with no retention, a swirl of caramel, slight cinnamon, and pipe-like smokiness. This malt-forward style hits with ribbons of caramel, layers of toffee, and a toasted pumpkin in an au natural vegetal state. What starts as a solid savory ale slowly sweetens with warmth and releases a noticeable clove edge making this light-bodied pumpkin into something I would gladly pair with my Thanksgiving vegetables.